Rediscover the Eastern Townships by taking this scenic 418-kilometre route full of treasures that have stood the test of time. To learn more about them and not miss anything along the Townships Trail, be sure to get the Townships Trail information and promotional resources. 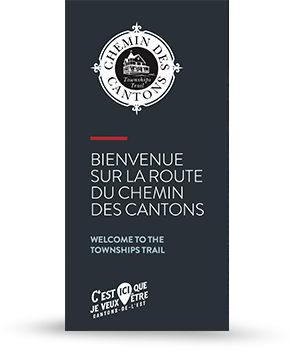 The Townships Trail map will guide you along the 418 kilometres of this scenic route through the Eastern Townships. The regions, places to discover, and Friends of the Townships Trail are all identified.You may obtain it in three ways: by free download, by ordering it (road map is free, though handling charges apply) or by asking for it in various distribution points. 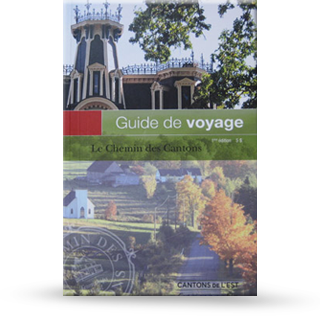 Available in tourist information offices and welcome centres in the Eastern Townships. The resources can also be ordered by Internet at info@atrce.com, by telephone at 819 820-2020 or toll free at 1 866 963-2020. Handling fees are added for items shipped by post. The Townships Trail travel guide includes a historic component, maps, photos, and an architectural guide on our American and British cultural heritage. This is a well-designed and captivating little guide that will increase your knowledge and unveil the region’s hidden treasures. You may obtain it in three ways: by free download, by ordering it ($3 + handling charges apply) or by asking for it in various distribution points. 3$ + Handling fees are added for items shipped by post. 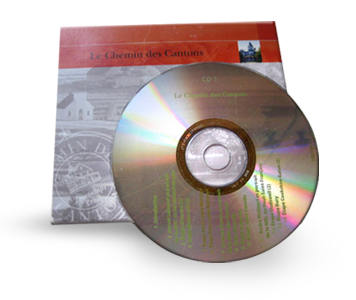 This kit of three compact disks provides information on the history of sites as well as anecdotes, legends, and the interpretation of various communities, with Eastern Townships artists. You may obtain them in three ways: by free download, by ordering them ($12 + handling charges apply) or by asking for them in various distribution points. $12 +Handling fees are added for items shipped by post.